This year's meeting will be held at the Hyatt Regency Scottsdale Resort and Spa at Gainey Ranch. Set amidst flowering cactus and framed against the majestic McDowell Mountains, this remarkable 27 acre Scottsdale Arizona hotel and spa resort is minutes from a host of activities and miles from the ordinary. Enjoy breathtaking vistas blended with intriguing Native American culture and pampering amenities at a Scottsdale resort designed to please every guest. The remarkable amenities of the Hyatt Regency Scottsdale Resort and Spa at Gainey Ranch, includes championship golf, Spa Avania, a 2.5 acre water playground, tennis or Camp Hyatt Kachina. Find your own opportunity for adventure just minutes from the resort. Expansive meeting facilities provide the premier setting for business gatherings, just minutes from all the attractions of this vibrant area. Our preferred rate at the Hyatt Gainey Ranch, is $219 single/double. To reserve your hotel room, please contact the hotel directly at (480) 444-1234 and note that you are with the "UTA". Gainey Ranch will honor these rates three (3) days prior and three (3) days following our conference dates, based on availability. To guarantee availability and rates, reservations must be made prior to October 5th. Exit the airport following the signs to the 202 East. Take the 202 East to the 101 North. Continue on 101 North to the Via De Ventura Exit and make a left. Travel West for approximately 2.5 miles (Via De Ventura turns into Doubletree Ranch Road). The Hyatt Regency Scottsdale will be on the right side just before Scottsdale Road. 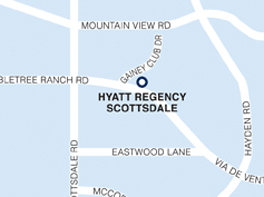 Hyatt Gainey Ranch is located eighteen miles from Sky Harbor Airport. Rental car agencies and taxi services are available from the airport. Drive time is approximately 20 minutes.